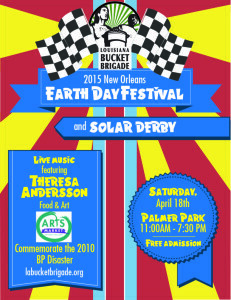 The Louisiana Bucket Brigade will celebrate Earth Day festivities in New Orleans this weekend with a festival and Solar Derby in Carrollton’s Palmer Park. The free event will be start at 11 a.m. Saturday, April 18, at Palmer Park at the corner of South Carrollton and South Claiborne Avenues. There will be performances by musicians such as Theresa Andersson, EarPhunk, Mia Borders, The Stooges Brass Band and Africa Brass. This event will also remember the five year anniversary of the BP oil spill and reflect on the importance of protecting the planet.